What makes Miri Piri Academy different? Miri Piri Academy is based on the teachings of the Siri Singh Sahib Yogi Bhajan. Our program combines rigorous academics, daily practice of Kundalini Yoga and meditation, and a strong sense of community to give each student an experience of self-mastery and leadership. Parents send their children to Miri Piri Academy to learn and practice a spiritual lifestyle, develop self-discipline and confidence, and give them the skills and the knowledge they will need to be successful in life. Miri Piri Academy accepts students from any country or background, regardless of language abilities. Students who are not proficient in English are placed in a special ESL program for the first school year and receive extra help so that they can catch up with their peers. By the end of the first school year, ESL students who apply themselves are generally fluent in English and able to keep up in the classroom. Students who join from 9th to 11th grade may not be able to take Cambridge or Advanced Placement Examinations if their English skills and academic foundation are not adequate. Read more about our Academic Program here. What if my children and I are not Sikhs? Miri Piri Academy accepts many students from diverse faiths and backgrounds. 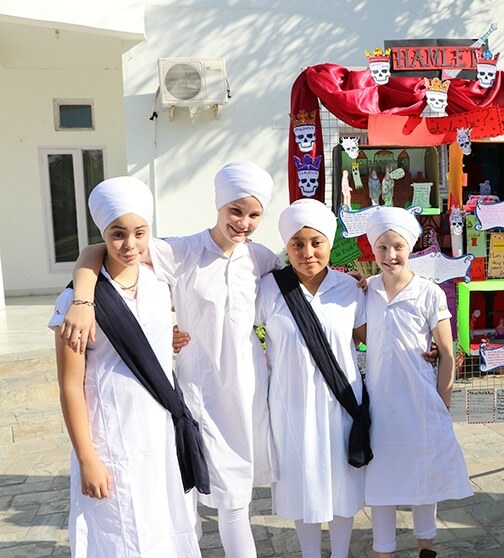 Although the school’s program is based on the teachings of Sikhism, students of any race, religion or culture are welcome. 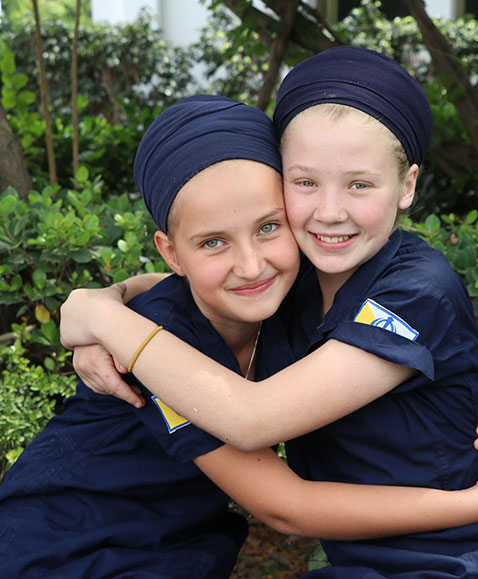 While students are required to practice the Sikh lifestyle as a part of our program, there is no expectation that they will adopt the Sikh religion or practice Sikhism in their personal life. As long as a student’s religious practices and beliefs do not interfere with their full participation in the Miri Piri Academy program, they are welcome to believe and practice any other religion while attending the school. If my child goes to MPA, will they be able to go to college or university in our home country? MPA is accredited by the University of Cambridge International Examinations (CIE) (www.cie.org.uk) and the Advanced Placement (AP) program, which are recognized by schools and universities all over the world. Students who take the AP or Cambridge International Examinations in 12th grade will receive certificates that are accepted by the best colleges and universities. Students must obtain a 70% in all core subjects in order to sit for these exams. Students from Miri Piri Academy have a unique background that gives them an edge over other college applicants. Students have been accepted to such prestigious universities as UC Berkeley, Mt Holyoke College, and Vassar. Read more about our Academic Program here. The school year generally begins in August and ends in May. Students taking Cambridge examinations may be required to stay into June to complete their exams. What are the extra-curricular activities at MPA? Miri Piri Academy offers a wide range of extra-curricular activities, ranging from sports to art to community service. Students are required to participate in a sports program that includes football (soccer), basketball, ultimate frisbee, and Kabaddi (a Punjabi wrestling sport). Students choose one of the fine arts, including classical Indian vocals, tabla, sitar, pottery and Bhangara dancing. Training in Gatka, a traditional Sikh martial art, and participation in community service (Sewa) programs are mandatory for all students. Will my child be able to travel and see other parts of India? Every year during the Winter and Spring break the school travels to other parts of India for vacation and sightseeing. Past trips have included Manali, Dharmsala, the Taj Mahal, Rajasthan and Rishi Kesh. Twelfth-grade students also have the opportunity to go on the Senior Class Trip in countries like Australia, Malaysia, or Thailand. Miri Piri Academy accepts all children from 5th to 11th grade who are inspired by our mission and want to challenge themselves to excel. Anyone applying to 12th grade must have completed Level I Kundalini Yoga Teacher certification prior to the start of the school year. We want to ensure that every child who is inspired to come to MPA can do so, regardless of their financial status. More than half of our families qualify for some amount of Financial Aid, depending upon need. When can I have the acceptance letter? Online application has been completed. Prior school transcripts have been received. An interview has been completed and student approved for Admission. The Entrance Fee has been deposited. All outstanding dues and fees have been paid. What does the Tuition Fee not include? The tuition fee does not include textbooks, CIE exam fees, ESL Classes, field trips, spending money, or incidental expenses like extra uniforms, academic supplies, or outside medical and dental services. Are there discounts for Indian residents? There is no special discount for Indian residents but there are scholarships set aside only for Indian residents who may be awarded scholarships in addition to Financial Aid discounts. Siblings of the same parents are eligible for a 5 to 10 percent rebate in the Annual Base Tuition Fee, depending on the number of siblings. This discount does not apply to the other charges/fees, including the Entrance Fee. The rebate is valid only during the time the brother/sister is studying at MPA, and shall be withdrawn upon his/her graduation or withdrawal from the school. What is the Incidental Deposit? An Incidental Deposit to cover supplemental expenses must be made at the time of admission for all students. The funds are used to cover the following types of expenses; textbooks, CIE exam fees, tutoring, ESL classes, medical expenses, field trips, additional excursions, extra school expenditures such as replacement of textbooks, supplies, shoes, uniforms, etc., and other incidental needs (as and when they arise). The Incidental Deposit must be replenished when it reaches the Rs. 5000 level. How can I send extra-spending money for my child? Extra-spending money may be included as extra funds with installment plans or may be arranged with the accounts department at any time for payment by credit card or wire. Please inform the accounts department when extra-spending money has been sent. What kind of visa do I need to obtain for my child? Students at Miri Piri Academy must have a valid Student Visa issued by the Indian Embassy in their home country unless they are an Indian citizen, have Indian residency, or possess a valid PIO card from the government of India. An X visa, often issued to the children of NRI’s, is not a valid substitute. How can I make travel arrangements for my child? Each parent is expected to work directly with the airlines or with their own travel agent to make their child’s travel arrangements according to our guidelines. Please refer to the information on the travel page for details. Can my child arrive at school earlier or later than the scheduled time? No, students must arrive during the slated Arrival and Departure dates. Any student arriving late or leaving early must have written permission from the Principal. What are the luggage allowances? Luggage allowances depend on the airline and the city of departure. Please contact your travel agent or the airline directly to get accurate information. What should my child bring to the school? What should they not bring? Packing guidelines are listed on the official Packing List that is provided to applicants upon completion of their Online Enrollment forms. Can I travel to the school to get my child settled? Parents are welcome to visit the school campus at any time. However, the school often leaves on an extended trip within a few days of the student’s arrival. This trip is designed specifically to help our students integrate quickly with their peers and become familiar with the staff in an informal setting. We ask parents not to participate in this particular event. When can I visit my child during the school year? Parents are welcome to visit their children at any time except during the initial trip scheduled at the beginning of the school year. Parents are encouraged to purchase cell phones that students can use to stay in touch with their parents and friends on the weekends and for one hour each evening during weekdays. The school can arrange the purchase of cell phones and calling cards for students from the Incidental Deposit. The school building and dorms are also equipped with Wifi internet access so students can send emails and talk on Skype during their free time. Can my child come home for family reasons during the school year? Student leave is granted on a case by case basis. Students are generally excused to attend significant events such as weddings, births, illness, or death in their immediate family if the school receives an official request directly from their parents. However, the student is expected to take responsibility to make up all school work missed. Once your child has been accepted as a student at Miri Piri Academy, an official Letter of Acceptance will be issued. This letter is necessary to apply for a visa from the Indian Consulate General. In order for your child to attend Miri Piri Academy, he or she must have a valid passport from their country of citizenship, and a Student (S) Visa issued from the Indian Consulate General in his or her State or Country. Please note that if a child arrives at our school with an Entry (X) Visa or a Tourist (T) Visa, we are unable to allow them to study at our school. Students must be a legal resident of India or have a Student (S) Visa to study at Miri Piri Academy. Students must arrive on campus during the School Arrival Window and depart during the School Departure Window. For details click here. Any student that arrives late or departs early without the express written permission of the Principal will be charged an INR 6000 Absence Fee per day. Parents of 10th and 12th grade students who are taking CIE exams are advised to purchase tickets with changeable return dates in case their child’s exams end before the last official exam dates. Exam dates will be published in the month of September. Students may arrive and depart with the chaperoned group, or they may be picked up or dropped off at the Amritsar International Airport or the Amritsar Train Station. Parents are expected to book their flights and send us the itinerary at least one month before the student will be traveling. If we do not receive an itinerary within one month of a student’s departure from Miri Piri Academy, we will book the child a one-way ticket home and bill parents accordingly. To facilitate supervised travel, a chaperone is sent on a flight through a primary travel center each year. Parents will be informed about the specifics at the time of enrollment and they have the option to book their child on the flight with the chaperoned group or arrange an alternate travel plan. All students traveling on the chaperoned flight will be charged a Chaperone Fee each way. Students are expected to bring all required items listed in the official Packing List. In case the required items are not available or cannot fit within airline luggage allowances, students may purchase required items using funds from their Incidental Deposit.